Rylee Smith spends her days behind a computer. She hides away in her home diligently working to make her next deadline. Escaping her father’s grasp keeps her motivated. Being an author doesn’t leave a lot of time for a social life. If it wasn’t for her -- nagging, yet loving -- best friend she wouldn’t see beyond the walls around her and the screen. Mason Carlson hasn’t had the easiest life. Growing up with a tyrant for a father and a brother just as demented, he struggles to find his place within the family. He was given one assignment. Watch her and wait for further instructions. Mason never expected to become attached to her. He never expected that her screams would cause him such pain. When secrets are exposed, Mason realizes everything he thought to be true is lie. It will take everything in him to right those he has wronged. Everything he has to set her free. And to find a way to Fight the Darkness. **Recommend for 18+ due to Violence, language, and adult situations. This story was heart gripping and captivating. 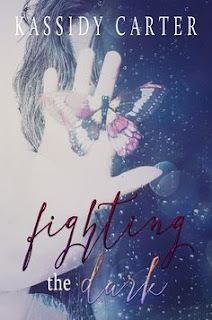 Sometimes you need a lil dark romance in your life and Fighting the dark was the perfect book. Mason is the brooding bad boy that has some good in him that makes you fall in love with him. This book definitely has some dark issues that are heartbreaking. There were times when I didn't think it was gonna go the way I wanted than it would turn around and than I would be screaming at the book again. My first reaction to the first couple of chapters was "what the heck is going on?" This was my first time reading Kassidy Carter and it will not be my last. Her writing style flows so beautifully that you don't realize how long you've been enthralled with this story.